Top: The four largest asteroids are 1 Ceres, 4 Vesta, 2 Pallas and 10 Hygiea (given mean-diameters may vary depending on source). 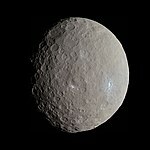 Bottom-left: Ceres is the largest and most massive asteroid and the only one that is a dwarf planet. Bottom-right: Vesta is the brightest and second-most-massive asteroid. It suffered a crust-penetrating impact approximately one billion years ago. Estimating the sizes of asteroids from observations is difficult due to their irregular shapes, varying albedo, and small angular diameter. For example, pure C-type asteroids are much darker than most. Asteroids with only one or two axes measured may have a falsely inflated geometric mean diameter if the unknown second or third axis is significantly smaller than the primary axis. Asteroid 16 Psyche has an IRAS diameter of 253 km, yet has a more recent and accurate geometric mean of only 186 km. 451 Patientia 225 225×234 3.059 December 4, 1899 Charlois, A. 375 Ursula 216 189×192×194 3.126 September 18, 1893 Charlois, A. The number of bodies grows rapidly as the size decreases. Based on IRAS data there are about 140 main-belt asteroids with a diameter greater than 120 km. For a more complete list, see List of Solar System objects by size. The inner asteroid belt (defined as the region interior to the 3:1 Kirkwood gap at 2.50 AU) has few large asteroids. Of those in the above list, only 4 Vesta, 19 Fortuna, 6 Hebe, 7 Iris and 9 Metis orbit there. Below are the nineteen most massive measured asteroids. The masses of asteroids are calculated from perturbations they induce on the orbits of other asteroids, except for asteroids that have been visited by spacecraft or have an observable moon, where a direct mass determination is possible. Different sets of astrometric observations lead to different mass determinations; the biggest problem is accounting for the aggregate perturbations caused by all of the smaller asteroids. The relative masses of the top twelve asteroids known, compared to the remaining mass of the asteroid belt. (All the data above are from Baer et al. 2011, apart from 48 Doris and 532 Herculina, which are Kochetova, 2004. The proportions assume that the total mass is 3.0×1021 kg, or 6991150000000000000♠(15.0±1.0)×10−10 M☉. Significant uncertainties remain. For example, the uncertainty in the estimate of 31 Euphrosyne is enough for its low end to overlap with both 704 Interamnia and 511 Davida, which overlap each other and also with 532 Herculina, which overlaps with 15 Eunomia and 3 Juno. Juno barely overlaps 52 Europa, which in turn overlaps with 16 Psyche. That is, outside the top four, the order of all the asteroids is uncertain. However, none of the lesser asteroids, of which the most massive are thought to be 88 Thisbe (at 17–19×1018 kg), 7 Iris, 29 Amphitrite and 48 Doris (all in the range of ≈15×1018 kg), overlap with Europa or Psyche, so the first 12 asteroids in the chart above are likely to be the top dozen unless a hitherto unmeasured asteroid proves to be unexpectedly massive. The largest asteroids with an accurately measured mass, due to the fact that they have been (and are being) studied by the probe Dawn, are 1 Ceres with a mass of 939.3 ± 0.5×1018 kg, and 4 Vesta at 259.076 ± 0.001×1018 kg. The third-largest asteroid with an accurately measured mass, due to the fact that it has moons, is 87 Sylvia at 14.78 ± 0.06×1018 kg. For a more complete list, see List of Solar System objects by size. Other large asteroids such as 423 Diotima currently only have estimated masses. Only Vesta regularly attains a brightness sufficient to be visible to the naked eye. The following asteroids can all reach an apparent magnitude brighter than or equal to the +8.3 attained by Saturn's moon Titan at its brightest, which was discovered 145 years before the first asteroid was found owing to its closeness to the easily observed Saturn. None of the asteroids in the outer part of the asteroid belt can ever attain this brightness. Even Hygiea and Interamnia rarely reach magnitudes of above 10.0. This is due to the different distribution of spectral types within different sections of the asteroid belt being such that the highest-albedo asteroids are all concentrated closer to Mars, and much lower albedo C and D types being common in the outer belt. Those asteroids with very high eccentricities will only reach their maximum magnitude on unusual occasions when their perihelion is very close to a heliocentric conjunction with Earth, or (in the case of 99942 Apophis) when the asteroid passes very close to Earth. * Apophis will only achieve that brightness on April 13, 2029. It typically has an apparent magnitude of 20–22. For a more comprehensive list, see List of slow rotators (minor planets). This list contains the slowest-rotating known minor planets with a period of at least 1000 hours, or 41​2⁄3 days, while most bodies have rotation periods between 2 and 20 hours. Also see Potentially slow rotators for minor planets with an insufficiently accurate period (U < 2). For a more comprehensive list, see List of fast rotators (minor planets). This list contains the fastest-rotating minor planets with a period of less than 100 seconds, or 0.027 hours. Bodies with a highly uncertain period, having a quality of less than 2, are highlighted in dark-grey. The fastest rotating bodies are all unnumbered near-Earth objects (NEOs) with a diameter of less than 100 meters (see table). Among the numbered minor planets with an unambiguous period solution are (459872) 2014 EK24, a 60-meter sized stony NEO with a period of 352 seconds, as well as (335433) 2005 UW163 and (60716) 2000 GD65, two main-belt asteroids, with a diameter of 0.86 and 2.25 kilometers and a period of 1.29 and 1.95 hours, respectively (see full list). Minor planets with orbital inclinations greater than 90° (the greatest possible is 180°) orbit in a retrograde direction. As of March 2018[update], of the near-800,000 minor planets known, there are only 99 known retrograde minor planets (0.01% of total minor planets known). In comparison, there are over 2,000 comets with retrograde orbits. This makes retrograde minor planets the rarest group of all. High-inclination asteroids are either Mars-crossers (possibly in the process of being ejected from the Solar System) or damocloids. Some of these are temporarily captured in retrograde resonance with the gas giants. ^ the value given when the number of observations is multiplied by the observation arc; larger values are generally better than smaller values depending on residuals. Mars trojans: (121514) 1999 UJ7, 5261 Eureka, (101429) 1998 VF31, (311999) 2007 NS2, (385250) 2001 DH47, 2011 SC191, 2011 UN63, and the candidate 2011 SL25. Jupiter trojans: the first one was discovered in 1906, 588 Achilles, and the current total is over 6,000. 2004 FH 0.030 March 15, 2004 Discovered before it approached within 43,000 km of Earth on March 18, 2004. The above table lists only numbered asteroids that are also comets. Note there are several cases where a non-numbered minor planets turned out to be a comet, e.g. C/2001 OG108 (LONEOS), which was provisionally designated 2001 OG108. In earlier times, before the modern numbering and naming rules were in effect, asteroids were sometimes given numbers and names before their orbits were precisely known. And in a few cases duplicate names were given to the same object (with modern use of computers to calculate and compare orbits with old recorded positions, this type of error no longer occurs). This led to a few cases where asteroids had to be renamed. 330 Adalberta An object discovered March 18, 1892 by Max Wolf with provisional designation "1892 X" was named 330 Adalberta, but was lost and never recovered. In 1982 it was determined that the observations leading to the designation of 1892 X were stars, and the object never existed. The name and number 330 Adalberta was then reused for another asteroid discovered by Max Wolf on February 2, 1910, which had the provisional designation A910 CB. 525 Adelaide and 1171 Rusthawelia The object A904 EB discovered March 14, 1904 by Max Wolf was named 525 Adelaide and was subsequently lost. Later, the object 1930 TA discovered October 3, 1930 by Sylvain Arend was named 1171 Rusthawelia. In those pre-computer days, it was not realized until 1958 that these were one and the same object. The name Rusthawelia was kept (and discovery credited to Arend); the name 525 Adelaide was reused for the object 1908 EKa discovered October 21, 1908 by Joel Hastings Metcalf. 715 Transvaalia and 933 Susi The object 1911 LX discovered April 22, 1911 by H. E. Wood was named 715 Transvaalia. On April 23, 1920, the object 1920 GZ was discovered and named 933 Susi. In 1928 it was realized that these were one and the same object. The name Transvaalia was kept, and the name and number 933 Susi was reused for the object 1927 CH discovered February 10, 1927 by Karl Reinmuth. 864 Aase and 1078 Mentha The object A917 CB discovered February 13, 1917 by Max Wolf was named 864 Aase, and the object 1926 XB discovered December 7, 1926 by Karl Reinmuth was named 1078 Mentha. In 1958 it was discovered that these were one and the same object. In 1974, this was resolved by keeping the name 1078 Mentha and reusing the name and number 864 Aase for the object 1921 KE, discovered September 30, 1921 by Karl Reinmuth. 1095 Tulipa and 1449 Virtanen The object 1928 DC discovered February 24, 1928 by Karl Reinmuth was named 1095 Tulipa, and the object 1938 DO discovered February 20, 1938 by Yrjö Väisälä was named 1449 Virtanen. In 1966 it was discovered that these were one and the same object. The name 1449 Virtanen was kept and the name and number 1095 Tulipa was reused for the object 1926 GS discovered April 14, 1926 by Karl Reinmuth. 1125 China and 3789 Zhongguo The object 1928 UF discovered October 25, 1928 by Zhang Yuzhe (Y. C. Chang) was named 1125 China, and was later lost. Later, the object 1957 UN1 was discovered on October 30, 1957 at Purple Mountain Observatory and was initially incorrectly believed to be the rediscovery of the object 1928 UF. The name and number 1125 China were then reused for the object 1957 UN1, and 1928 UF remained lost. In 1986, the object 1986 QK1 was discovered and proved to be the real rediscovery of 1928 UF. This object was given the new number and name 3789 Zhongguo. Note Zhongguo is the Mandarin Chinese word for "China", in pinyin transliteration. Asteroid 1317 and 787 Moskva The object 1914 UQ discovered April 20, 1914 by G. N. Neujmin was named 787 Moskva (and retains that name to this day). The object 1934 FD discovered on March 19, 1934 by C. Jackson was given the sequence number 1317. In 1938, G. N. Neujmin found that asteroid 1317 and 787 Moskva were one and the same object. The sequence number 1317 was later reused for the object 1935 RC discovered on September 1, 1935 by Karl Reinmuth; that object is now known as 1317 Silvretta. ^ Carry, B.; et al. (2009). "Physical properties of (2) Pallas" (PDF). Retrieved 13 September 2015. ^ "JPL Small-Body Database Search Engine: asteroids and orbital class (IMB or MBA or OMB) and diameter > 120 (km)". JPL's Solar System Dynamics Group. Retrieved 2012-04-16. ^ a b "Recent Asteroid Mass Determinations". Maintained by Jim Baer. Last updated 2010-12-12. Access date 2011-09-02. ^ Baer, James; Steven R. Chesley (2008). "Astrometric masses of 21 asteroids, and an integrated asteroid ephemeris" (PDF). Celestial Mechanics and Dynamical Astronomy. Springer Science+Business Media B.V. 2007. 100 (2008): 27–42. Bibcode:2008CeMDA.100...27B. doi:10.1007/s10569-007-9103-8. Retrieved 2008-11-11. ^ a b Pitjeva, E. V. (May 2005). "High-Precision Ephemerides of Planets—EPM and Determination of Some Astronomical Constants" (PDF). Solar System Research. 39 (3): 184. Bibcode:2005SoSyR..39..176P. doi:10.1007/s11208-005-0033-2. ^ Michalak, G. (2001). "Determination of asteroid masses". Astronomy & Astrophysics. 374 (2): 703–711. Bibcode:2001A&A...374..703M. doi:10.1051/0004-6361:20010731. Retrieved 2008-11-10. ^ Michalak, G. (2001), assumed masses of perturbing asteroids used in calculations of perturbations of the test asteroids. ^ "(99942) Apophis Ephemerides for 13 Apr 2029". NEODyS (Near Earth Objects—Dynamic Site). Retrieved 2011-05-05. ^ "(99942) Apophis Ephemerides for 13 Apr 2029". Minor Planet Center Ephemeris Service—Dynamic Site). ^ "JPL Small-Body Database Search Engine: Asteroids and i > 90 (deg)". JPL Solar System Dynamics. Retrieved 2019-03-31. ^ Morais, M.H.M. ; F. Namouni. "Asteroids in retrograde resonance with Jupiter and Saturn". Monthly Notices of the Royal Astronomical Society Letters (in press). arXiv:1308.0216. Bibcode:2013MNRAS.436L..30M. doi:10.1093/mnrasl/slt106. ^ "1994 Release #9412" (Press release). NASA. 1994-02-18. Retrieved 2008-04-17. ^ "29075 (1950 DA) Earth Impact Risk Summary". NASA/JPL Near-Earth Object Program Office. 7 December 2015. Retrieved 11 March 2018.